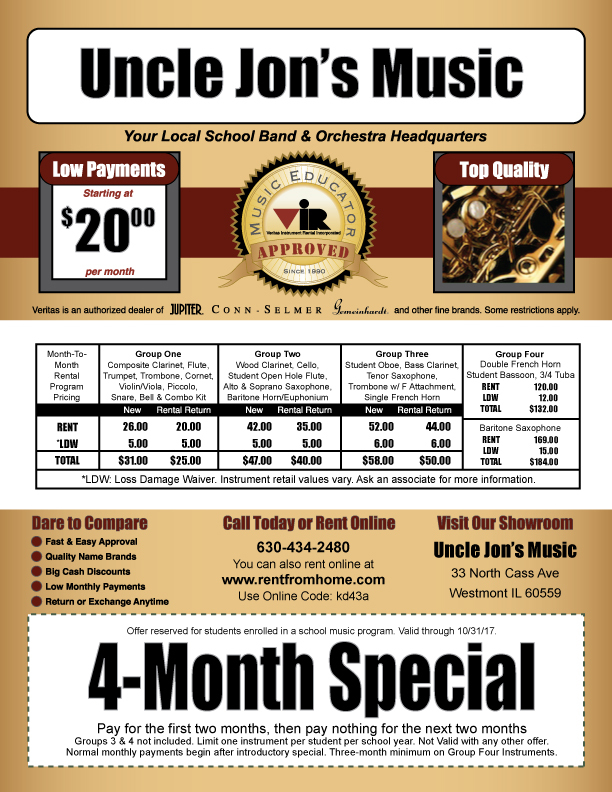 When you rent your school-approved band and orchestra instruments from Uncle Jon's Music you get the peace of mind that comes from renting quality, verified instruments from a local music supplier. Brand names among our offerings include Selmer, Bach, Ludwig, King, Conn, Artley, Armstrong, Benge, Hermann Beyer, Scherl & Roth, Holton, Vito, Gemeinhardt, Jupiter, Ross, Josef Reiter, Knilling, Vic Firth and more. We offer an affordable, month-to-month rental plan with payments starting as low as $25 a month with 0% interest. Don’t wait until the last minute! Get the pick of the litter by reserving your instrument now and you owe nothing until you pick up. With no obligations and no termination penalty your child has the opportunity to try new things without putting a dent your budget. Call 630-434-2480 or stop by our store for more information. Special intro deal for new renters: Pay for two months, get two months free.